Click on a date to learn about the Library’s history. You can also watch a short documentary in which Library Life host Cathy Cushing takes you on a journey through the years of our history from inception to present. 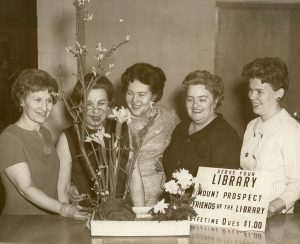 The idea of a public library in Mount Prospect began in October 1929 through the efforts of the Mount Prospect Woman’s Club. The club’s Library committee began going door to door seeking donations of books and money. As reported in a Herald article from November 1929, the Mount Prospect Improvement Association donated $50 towards the effort, one of many donations of books and money that would be needed to keep the Library open for the next 13 years. The Library officially opened on January 6, 1930 in a one-room schoolhouse on the corner of Main Street and Central Road, and was staffed by volunteers from the Woman’s Club. It consisted of a single tier of shelves holding about 300 books; residents could use the collection one day a week for a few hours. The schoolhouse was later relocated and restored by the Mount Prospect Historical Society. The Mount Prospect Woman’s Club members strove to offer more resources and services by continuing to ask for donations, offering newer books for rent, and seeking guidance from the Chicago Public Library. By 1934 there were 415 borrowers; the collection totaled 1,203. In 1935 the Woman’s Club asked the village to provide a new location, as the schoolhouse was no longer going to be available to them. The village offered a small red-brick building that formerly housed the Mount Prospect State Bank on the northeast corner of Main Street and Busse Avenue. The Library opened on Thursday afternoons in its new location in September 1935. Although the Depression continued through the next five years, Mount Prospect residents were generous, and continued to offer monetary and book donations. Other ways of raising money were also sought by the Woman’s Club; the proceeds from an amateur talent show hosted by the Lions Club in December 1937 were given to the Library, and the Woman’s Club members canvased for funds each year, using the money to purchase new books. The collection continued to grow—345 books were added between 1939 and 1940 for a total of almost 4,000 books. From a list of 25 bestsellers in that year, Mount Prospect Library had 17 of the titles on its rental shelf. Almost 900 cards were issued. At this time there were 1,710 people in the village; the Library was open only four hours a week but there was a desire for it to be open more often. In addition, the needs of the Library continued to grow, even as the country faced World War II—a children’s summer reading club was begun in 1942 and 200 children enrolled, and a victory shelf was established in October 1942 to present materials interpreting various phases of the war effort. It became obvious that the Library lacked the necessary resources to support the needs of the community. Mrs. Gehringer, the librarian, was paid 50 cents per hour, and the Library building had no heat or plumbing and required extensive repairs. 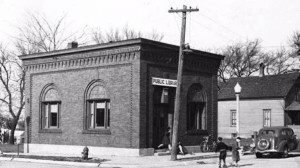 At the end of 1942, the idea of establishing a tax-supported library was enthusiastically supported by the public, and by local organizations such as the Men’s Club and the Parent-Teacher Association. 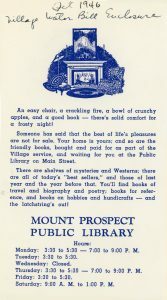 In a letter to Mount Prospect organization presidents, E.H. Cleven of the Men’s Club noted that Mount Prospect was the only village between Chicago and Harvard that did not have a tax-supported library. 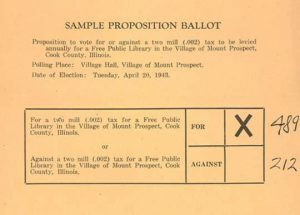 After much promotion by local organizations, the question of tax support was placed on the ballot during the April 1943 election. The results of the election were 489 in favor to 212 votes against, and Mount Prospect Public Library became official! The first citizens to serve as board members were Dorothy Kester, Martin Green, Meta Bittner, Ruth Carlson, Edmund Cleven and Mildred Gallagher. Irma Schlemmer was appointed the first official librarian; she would go on to serve in this capacity until December 1966. The young Library also received much assistance from the Chicago Public Library in the form of professional suggestion, furniture, and books. Chicago Public gave the Library 1,000 books for $200 per year, which it then returned to the Library to enable the purchase of children’s books. This help continued for twenty years. The members of the first tax-supported Library board met at each other’s houses because the current Library building had no meeting space. They worked diligently to find a new location, settling on a paint store building at 115 S. Main Street. 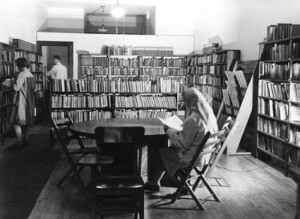 The Library moved there and opened to the public in September 1944. The Library was open more hours and offered additional resources, including phonographs, by 1946. As time went on, it became obvious that the Library needed its own building. In 1949, Library circulation was 26,400, and by 1950 Mount Prospect had 4,009 residents. The Library board was able to secure a lot at northwest corner of Busse Avenue and Emerson Street for $3,000 donated by community members. A $35,000 bond referendum was approved, and the first dedicated Mount Prospect Library building was built. 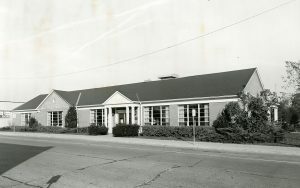 The Library moved into the building in July 1950. 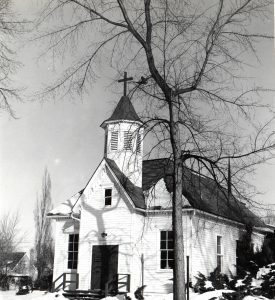 This building was eventually torn down to make way for the Village Hall in 2002. 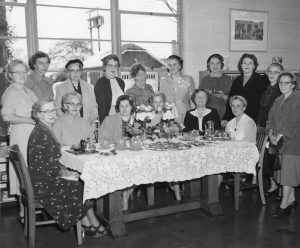 In 1955, members of the Woman’s Club celebrated the 25th anniversary of the founding of the original Library in 1930. 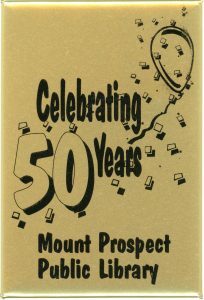 Meanwhile, Mount Prospect kept growing: In 1962 there were around 20,000 residents and 30,000 volumes in the Library collection. 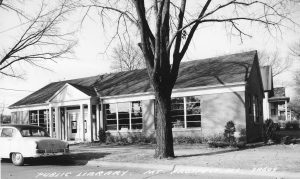 In response, the Library added an addition on the west side of the building, which was financed by a bond in 1961. There was then room for a children’s area and a more spacious lobby. A special open house revealed the changes to the public in November 1962. The total area of the building was 11,886 square feet. Mary Jo Hutchings became the director of the Library in 1966, and faced many challenges including societal changes, difficult finances, contentious relations with the Village Board, growing demand for services, and a lack of space. The Library still continued to be a lively place, though; the Friends of the Library group helped with special programs and celebrations such as National Library Week. Paul Powell, Illinois Secretary of State, also visited Mount Prospect in 1966. More changes continued to come to the Library. A microfilm reader and magazine microfilm were added to the collection by donation from a special memorial fund. The collection of 33 rpm records was expanded. It was at this time the North Suburban Library System, composed of 27 area libraries, was formed. This allowed patrons to request books from other libraries. 8 mm films became part of the collection in 1968, and a copy machine in September 1968. 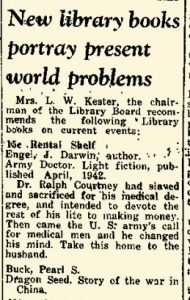 Troubled finances and a threatened service cut made Library life difficult, but there were still many things to celebrate at the Library’s 25th anniversary on October 6, 1968. Mount Prospect patrons used the Library frequently to check out books and records. They also attended storytimes, summer reading, and National Library Week programs. It was a tight fit, however; the expansion done in 1962 was no longer sufficient. Smaller renovation projects helped for a short time, but the Library was becoming a community gathering place. 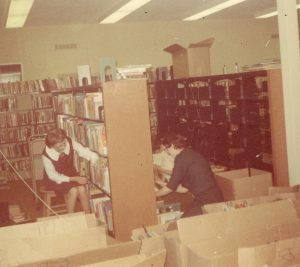 The number of staff increased, and enrolled in library science classes; cataloging procedures were standardized and professionalism was emphasized. By 1969 Mount Prospect had nearly 35,000 residents. To grow, the Library literally required the roof to be raised. This allowed the children’s room to move to the second floor. Staff, Library board members, and volunteers from other clubs moved the books. 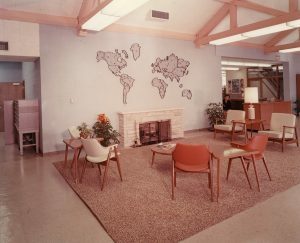 A young adult area with appropriate fiction and nonfiction materials was arranged around the fireplace, and the Library’s main entrance was now on Emerson Street. The Library welcomed patrons at an open house event on January 25, 1970. 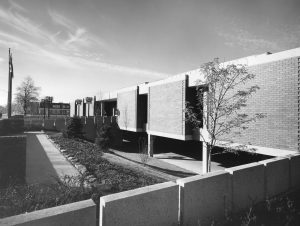 The 1970s brought more challenges for Mount Prospect and the Library. More areas were being annexed into the village, and the Library was asked to provide more services, such as resources for the visually impaired, films, and art prints. It was difficult to fit all the departmental offices in the building, so the Library added a mobile unit in 1972. It sat in the parking lot next to the Library building on Emerson Street, housing staff working on technical activities, such as processing books. Library staff continued to be engaged with the community and local events, including a visit by a president. Students, meanwhile, used Library resources in a very cramped atmosphere. 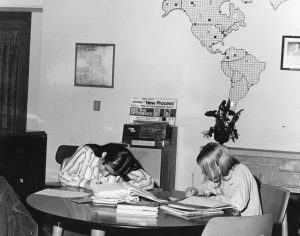 After several years of discussion with Village and school district officials, but without going to a referendum, the Library purchased the old Central School property and started construction of a totally new building on the corner of Central and Emerson Streets in 1975. It opened on December 6, 1976, and an open house was held on December 12. The Library was formally dedicated on January 23, 1977. The new 45,500 square foot building included a computerized circulation system, sheltered parking, loading dock, a 125-seat meeting room, a 26,000 square foot adult services area, and a 7,000 square foot Children’s Department. Possible future expansion was provided in the building’s structure. This was a much better Library for a community of 51,974 people. The new Library still faced some funding challenges. A referendum in October 1977 to raise the tax levy for book purchases failed. Money raised by special community events helped the Library to acquire more books. A drive-up window was provided in 1978. Another referendum to increase tax revenue in November 1979 did pass. 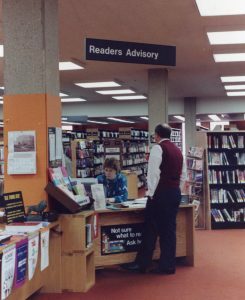 As the 1980s began, with 20 full-time and 13 part-time employees, the Library continued to adjust to respond to the needs of patrons. The community could take advantage of cassettes, films, genealogy microfilm, and a government information center. A collection of videotapes was started and programs for all ages, including bus trips, were offered. In May, 1981, Patricia Kelly became head librarian, a volunteer program began, and evening hours of service were extended. The Teddy Bear Walk became a holiday tradition in 1982. Keeping up with technology was an ever-present challenge, as the card catalog was replaced by computers in 1983. The Library had something for almost everyone in 1984. During the mid to late 1980s, programming at the Mount Prospect Public Library continued to thrive. All kinds of topics were covered—storytelling, a photography contest, crafts, genealogy, adult literacy, financial information, and microcomputers. 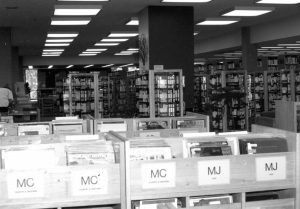 The Library board’s long range plan in 1985 proposed adding compact discs to the collection and exploring alternative ways of providing Library services. The transition to a computer catalog continued as plans were made to buy 10 computer terminals. Books remained vital to the Library; the book budget was increased significantly during these years. The maintenance of the building was an ever present issue; replacement of the roof was discussed in 1985. An outdoor sign was installed at the corner of Central Road and Route 83 in July 1985. It became an electronic one in 1989, funded by the Friends of the Library. The Library was very involved in the creation of an arts council that was formed in February 1986. As the collection grew (the video collection alone had 500 titles) it became apparent that a building of 50,000 square feet would not house it and a growing staff properly. Between 1966 and 1986, circulation increased from 383,056 to 580,000. Plans for expansion were explored in February 1986; an architect was selected in April 1986. Funds for employing more staff were also sought. 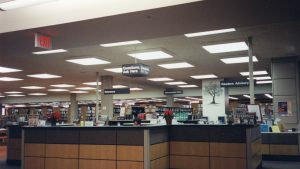 By the end of 1986, as it celebrated 10 years in the Emerson building, the Library had 174,000 books, 68 staff members, and was open 79 hours per week. A referendum tax hike for the Library held in April 1987 did not pass; neither did a second try in November 1987. As a result of the loss, service hours were cut from 79 to 69 hours a week. Charges for certain services and materials were adopted while reciprocal borrowing restrictions were implemented. Less space was available for lounge seating so that there was room for staff offices and a large collection. Despite these difficulties, the Library staff continued to offer both children and adult programs, as well as other Library services and resources, including computer software programs. A new roof was finally put on in July 1988 using available funds. Even as the Library dealt with financial issues, it continued improving its technology. By 1989 patrons with computers at home were able to view the Library catalog by using a telephone modem connection. The Library also operated a computer bulletin board to which patrons could connect. The Library’s collection continued to become more diverse. The Harold Weary Genealogy Collection was named for a long-time Library volunteer who was active in the local genealogy society. The Library sought to acquire paintings by Mount Prospect artists to add to its collection. Books remained the largest part of the collection—in August 1989 the Library celebrated the acquisition of its 200,000th book. In 1990, the Library became a federal government depository. 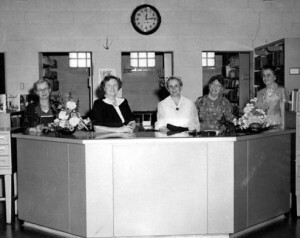 The staff remained a key part of the Library’s contribution to Mount Prospect. 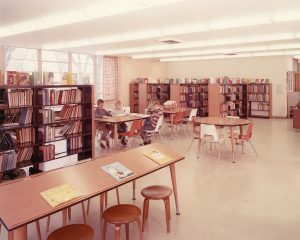 The Library employed 67 people in 1989 when the salary scale was adjusted in order to match those of other area libraries. At this time, Patricia Kelly was the executive director, and Marilyn Genther was the deputy director. 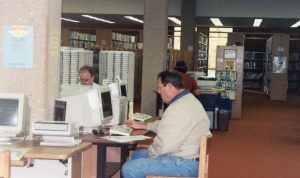 As the 1990s continued the Library continued to manage in a less than ideal work space. The Administrative staff was moved into offices in the second floor “penthouse.” A more favorable financial situation allowed the Library to extend weekday hours to 10 pm. The meeting room was made available to Mount Prospect non-profit groups for a fee. The important work done by volunteers was recognized by the creation of the Founders’ Award. Robert D. Teichert and John W. Parsons were the first honorees. In September 1991 the Library’s online catalog, CLCAT, debuted. This allowed for more efficient searching and future upgrades. The Library continued to be involved in the community, and offered Harper video courses for students. In preparation for the Village’s 75th anniversary in 1992, the Library assisted with creating a collection of oral histories. Resources for local businesses and job seekers were also provided. These services were in addition to a collection of 245,191 print and 32,912 non-print items. 70% of Mount Prospect residents had library cards in early 1992. In May 1992, Patricia Kelly retired. Marilyn Genther became executive director in July 1992. She took on the position as the Library and the community faced issues such as the implementation of the Americans with Disabilities Act, cuts in services from the North Suburban Library System, downtown redevelopment, homelessness in the Northwest suburbs, and continued financial challenges. Demand for Library services remained high. Yet in the midst of these challenges, the Library took time to celebrate its 50th Anniversary in 1993. About 1,000 people came to the birthday party on September 10, 1993, and enjoyed one of the biggest cakes the village had seen. A referendum for support of the Library in 1994 was again unsuccessful. In response, the Library shifted the collection to accommodate additional materials and offer more efficient service. 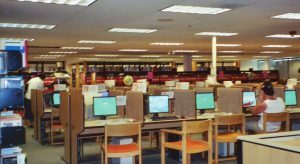 By 1995, patrons had access to the Internet, and the Library had its first webpage. The collection reached 300,000 volumes, and another attempt to get a referendum passed failed. Access to the World Wide Web was made available to the public through the graphical browser Netscape in 1996. The Library also moved all the audiovisual materials to the Adult Services area. By the end of the twentieth century, public computer use increased dramatically, and a third of circulation was of AV materials. 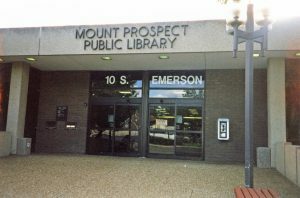 The Mount Prospect Public Library Foundation was formed in 1997, supporting Library activities, and MPPL prepared for Y2K. Along with the rest of the world, MPPL entered the 21st Century with celebration and caution. There were many questions about where this century would lead. Keeping these broader issues in mind, Library staff focused on daily tasks and programs while serving a community of 56,265 residents. The Collection Management Department that was formed in 1999 began to streamline the selection and acquisition of materials. A special focus on Reader’s Advisory in the Adult Services Department responded to a growing need for fiction reading guidance and book discussion groups. Educational and entertainment programming expanded for adults and children. The issue of lack of space continued to be pressing. In 2001 the collection numbered 369,475 print and audiovisual items, and shared 49,000 square feet with 16 public Internet access computers. The AV materials now included DVDs. Plans for adding a full second floor were revisited. In the meantime, in order to allow for better traffic flow and make interactions with staff more efficient, new adult and youth services desks were installed, and the Circulation area was remodeled using grant money. The Library’s local cable TV program Library Life also came to fruition in 2001. 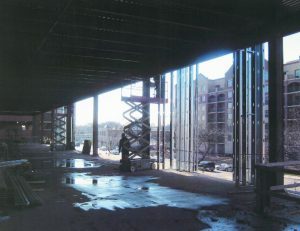 The Library board put the question of expansion to the community on March 19, 2002. The referendum passed by a 60% majority. Now the plans that had been made for a renovated building would come to fruition. The Library finalized plans for the expansion and began the complicated process of moving to temporary facilities at 852 Feehanville Drive in the Kensington Business Center. A closing ceremony at the old building was held on November 1, and the move to the Feehanville site began on November 4. All Library programs and services were again available in December 2002. 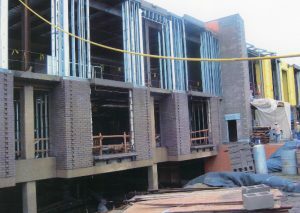 A Beam Raising ceremony was held on April 11, 2003 to mark the start of construction on the new Emerson building. While the Library was at the Feehanville building, it celebrated its 60th anniversary in September 2003. It also migrated to a new library automated circulation system. Annual circulation that year was 612,649 items. 433,906 items were in the collection. 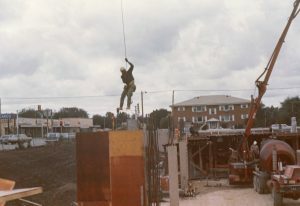 Back at the Emerson site, construction of the new building continued through 2003. By December 2003, its ultimate exterior appearance was apparent. The Library staff moved to the new Emerson building in August 2004. This structure had 101, 290 square feet of space, and included two levels with underground parking and a mechanical penthouse. Other features included three public meeting rooms, a computer training room, 51 public computer stations, a Teen Zone and 6 study rooms. The Library was officially opened to the public in September 2004. An open house for area libraries was held on September 10, and a Grand Celebration was held on October 17, 2004. Once the renovated Library opened in 2004 it became a busy community center. Items from the cornerstone of the 1950 building were placed in a new home next to the location of the 2004 time capsule in 2005. Permanent art including pottery, wall art, and sculpture purchased from 2005 to 2017 brought more color to the building. 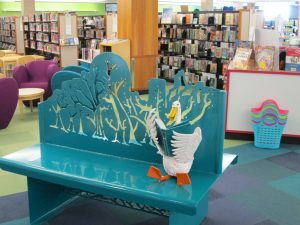 In 2006, the duck bench with Monty the duck was added to the Youth Services department in honor of the Friends of the Library; the outdoor “Peace” sculpture commissioned in honor of Elizabeth J. Clough was dedicated in 2007. Also in 2007, the redesign of mppl.org was launched. The Library continued its usual services like research help, storytime, summer reading, and educational presentations. There was even a visit from an astronaut in 2009! New services were also added, including in-library wireless access and downloadable ebooks. Computer classes helped patrons navigate the changing electronic world, and librarians were available for one-on-one reference help. In 2009, the South Branch on Algonquin Road was opened in the Community Connections Center; it has since become a vital place, helping many people unable to come to the Main branch. 2009 also marked the first time annual circulation hit one million. Book Crossing (Lectures Croisées), the first ever transcontinental book discussion in partnership with Mount Prospect’s Sister City library in Sèvres, France, took place in 2010, as did a visit of Sèvres library staff for one week in June. 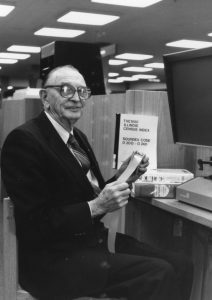 Harold Weary was awarded the Founders’ Award in 2011 for his 40 years of volunteer work at the age of 102, and in 2013 the Library had its 70th anniversary. 2013 also brought an author visit event with author Holly Black. Mount Prospect Public Library continues to add new services and improve its facilities to better serve the community. Its staff of 167 people has made the Library one of the top places to work in Chicago for five years in a row. Improved study rooms, a vital Teen Space, and a collection of over 452,000 items allow patrons places to study, engage in fun activities, and access a rich source of print, audio, and video information. The public access computers, wireless system, and website have been updated over the years, and outreach activities coordinated by a community outreach coordinator strive to better connect the Library to the community. MPPL continues to help its patrons “explore the opportunities.” It will strive to do so for the next 75 years!